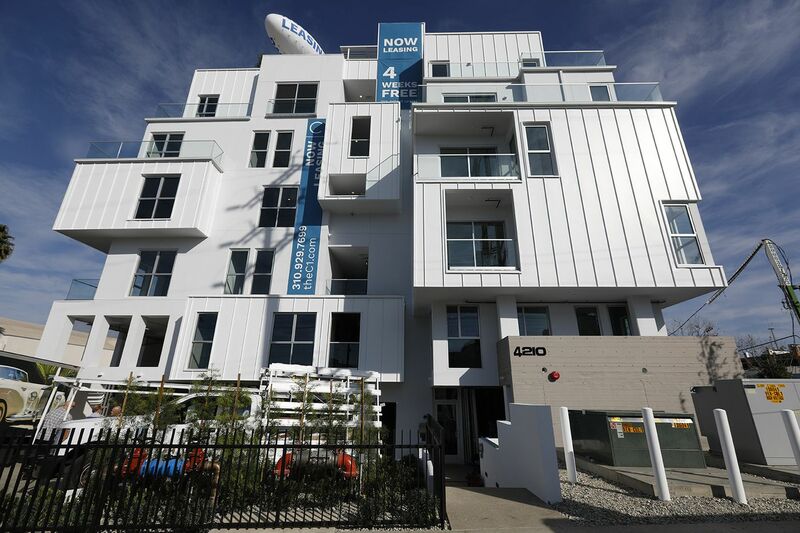 C1 apartment complex by California Landmark Group in Marina del Rey, Calif., is a ground-up development that will include co-living units. Residents will have their own bedrooms and bathrooms but share living rooms, kitchens, and, in some cases, bathrooms with others. The first step into a posh new apartment building near Marina del Rey in Los Angeles County, Calif., feels like a mistake. There’s no lobby — instead, the door opens to a lounge and kitchen. The idea is to encourage mingling, which is part of the appeal of a building where tenants have their own bedrooms but share common areas with people they don’t know. This is not your typical roommate situation. The bedrooms are spacious, the living rooms are furnished — and the residents are often selected by the landlord. Mortgage rates are expected to rise in 2019. If you’re shopping for a home, it could get tougher. Welcome to “coliving” in a time of sky-high rents. Real estate developers such as California Landmark Group, which owns the Marina del Rey apartment building, are pioneering a way of living by primarily catering to young professionals and creative types who enjoy luxury digs but can’t swing the rent in desirable neighborhoods. In Philadelphia, German real estate company Medici Living Group recently announced a six-story coliving building in Northern Liberties. Medici operates similar buildings in New York and Chicago. Although stretching out on a sofa with a stranger may strike many as unusual, it is not much of a leap to people already comfortable with Uber and Airbnb, said Ken Kahan, founder of the Los Angeles-based development company. Typically, a coliving renter has a private bedroom and can spring for a private bathroom, but shares the kitchen, living room, and other communal spaces. Units are furnished — sometimes at an Instagram-worthy level — and the rent usually includes services that aren’t covered in other apartments, such as utilities and WiFi. The Marina del Rey building even offers Netflix and maid services to head off squabbles. Coliving complexes have grown fairly common in European cities such as Berlin, London, and Dublin, Kahan said, and are springing up in New York, Seattle, San Francisco, Los Angeles, and elsewhere. For now, coliving is considered somewhat experimental. But if the small developments emerging in trendy housing markets succeed, more will probably follow. Coliving housing developer Anil Khera sees a link between coliving and the upmarket student housing complexes that have sprung up around college campuses. With amenities such as 24-hour fitness centers and resort-style pools, residential properties have established a new housing category that is a leap beyond the spartan dormitories and cracker-box apartments a generation ago. “You have millennials who have grown up in pretty fancy purpose-built apartments,” he said, and are unaccustomed to “slumming it” in old, unfurnished units once out of school. Coliving is the next step for graduates facing steep rents in desirable urban neighborhoods, said Khera, who in 2016 co-founded a company called Node, based in London. Promotional materials for one of Khera’s latest projects boast that its two 1920s-vintage bungalow court complexes are “Instagram ready,” featuring “curated” furnished interiors with designer kitchens that include retro-looking Smeg Italian refrigerators that retail for about $2,000. Artist's rendering of Quarters "coliving" project planned in Northern Liberties at Germantown Avenue and North American Street. The notion of coliving is hardly new, housing expert Richard K. Green said, but there may be a market for the upscale version emerging now. “A hundred years ago, people commonly lived in boarding houses, sharing a kitchen and a bathroom down the hall,” said Green, director of the USC Lusk Center for Real Estate. The country is wealthier now, and people are less accustomed to co-habitating with non-relatives, but the market is still potentially vast — about 16 percent of adults live with non-related roommates, Green said. Still, “whether people will want to live this way in large numbers, I don’t know,” he said. Even Kahan, of California Landmark, is taking baby steps. Only about 20 percent of the 68 units at the Marina del Rey complex are coliving; the rest are traditional singles and multi-bedrooms. The Philadelphia project plans 74 two- and four-bedroom coliving flats, in which residents share kitchens and bathrooms. Other communal spaces include a roof deck, lounge, espresso bar, and shared offices. Aside from the recent college graduates or other young people early in their careers, the model attracts “restarters” — people between 30 and 50 who might be coming out of a divorce or are otherwise launching a second act. “Maybe they had a house and a family and want to be taken care of instead of taking care of other people,” said Jon Dishotsky, CEO of Starcity in California, one of the largest coliving companies. The next frontier may be providing coliving beyond the current model aimed primarily at single adults by bringing more parents with children into the fold. Staff writer Jacob Adelman contributed to this report.